Loreto Sister Christine Burke is just one of more than 850 Loreto Sisters worldwide who ‘go where the need is greatest’. She lives and works in the Philippines helping our Sisters with spiritual and theological formation. 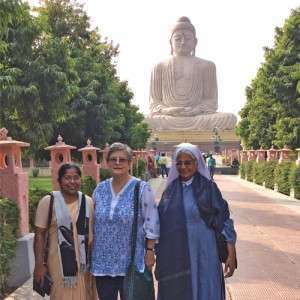 A wonderful opportunity beckoned through an unexpected email: Come to India and work with over 500 Sisters on deepening their understanding of Mary Ward. If I was to offer this two day workshop to the five separate Congregatio Jesu (the other half of the Mary Ward family) provinces/regions and the Institute of the Blessed Virgin Mary (IBVM/Loreto) this would require about eight weeks, given the spread of personnel and demands of travel. Each house offered wonderful hospitality and spoilt me thoroughly – being an older Sister, a guest and a workshop-giver gave great privileges! I restricted my curry and rice intake to two main meals a day, though it was available often at breakfast and for a quite sizeable afternoon snack. I kept well throughout; thanking God my Korean-Chinese community had prepared me to handle reasonable doses of chili or ‘pungent’ food. I changed bedrooms 23 times! The sub-continent became more than an outline map. I now can place more accurately Delhi, Bengaluru, Nain-tal, Allahabad, Lucknow, Patna, Kolkata, Darjeeling, Kathmandu, as well as a number of smaller missions associated with these cities. Long train trips, short flights and long days in jeeps gave great views of the countryside. Agriculture with rice terraces and tea gardens, maize and endless fields of vegetables, are extensive despite India accommodating 1.27 billion people. While some farms boasted goats and cattle, most of these claim the right to amble through city streets as well as villages – hitting a cow carries very serious penalties! Driving requires different skills to those recognised in Australia – avoiding unlit cars, carts, animals, chooks, wheel-chairs, bikes and buses on narrow roads at night, not to mention being ready to drive on the wrong side up a divided highway to avoid a traffic jam of humongous proportions are just beginning. I had worked on the training material well beforehand and ensured I had a data projector in each place. Encouraging the Sisters to think about issues impacting India today gave me a great overview: religious intolerance (growing due to government efforts to make India a Hindu State rather than a secular one), corruption, patriarchy in society and church, gender discrimination at all stages of the life-cycle, trafficking, poverty, violence, terrorism recurred frequently. They were surprised to see how many of these also applied to Mary Ward’s era – underlying concerns echo across cultures and centuries. They discovered she faced personal and institutional challenges that we can resonate with. We looked at the deep wells she drew on and tried to find ways of articulating these so that they have relevance today. Her gift to us is surely to live with her courage in our own challenging contexts. The session on CJ’s and Loreto was a ‘big picture’ overview of the 370 years since Mary Ward’s death, especially the efforts towards reunion in the late 19th and early 20th centuries. The importance of her sense of freedom, her ability to change, her commitment to women’s needs and her efforts to keep her companions united still challenge her daughters today. I found the Sisters commitment to these workshops quite inspiring. The number of younger Sisters gives great hope. In about seven of the eleven workshops the group was a mixture of CJ’s and IBVM’s. This trip also enabled me to visit many smaller communities, schools, projects. Mary Ward women staff an incredible number of schools and colleges – English, Hindi, Bengali, Nepali are standard mediums of communication. The students are often from families where parents did not have the opportunity of learning literacy, and these young people read fluently in English as well as their mother tongue. The Sisters come from varied cultures across this sub-continent. They live simply and are very aware of their environment. There are many younger women. They live out their commitment to the poor – in anti-trafficking awareness and action, income generating schemes, human rights and domestic violence awareness programs and literacy programs. The five Loreto schools around Kolkata have over 500 “Rainbow children” (street children) living on the top floors of schools and attending whichever schools meet their needs. Many of the graduates of these programs have gone on to college. Most students in our schools come from other spiritual traditions (Islam, Hindu, and some Buddhist) and are educated to appreciate each other’s spiritual writings. In a time of spiralling religious intolerance this is an incalculable gift to this country. Thousands would graduate from Mary Ward schools each year. The projects in the north are doing amazing work – very grateful to Australia and Mary Ward International Australia for all the support they have received. I was taken to the Taj Mahal, Mysore palace and to Buddha’s place of enlightenment. I also had two trips to very different viewpoints to marvel at the Himalayas at dawn-wonderful memories to treasure. I have felt very aware of the Holy Spirit moving among each group. I know that what has been accomplished is due to Wisdom entering our hearts. I have been grateful for the prayers accompanying me from Manila and Australia and from Vietnam and Timor-Leste. I’m exhausted at the end of this, but so grateful I’ve been able to do it.